I’ve been meaning to post this recipe for a while but have procrastinated because, seriously, do we really need another pancake recipe out there on the internet? 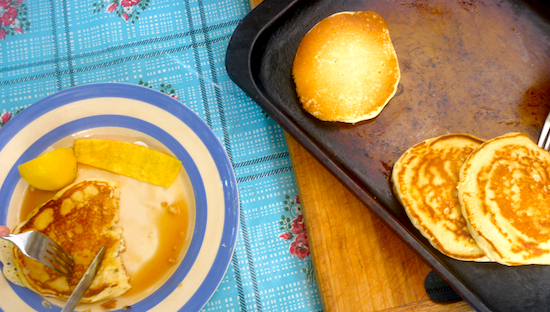 I can’t even pretend this is the ultimate pancake recipe, but it is the simplest pancake recipe I know: the sort of recipe you can whip up in a dodgy holiday kitchen and it will work every time. 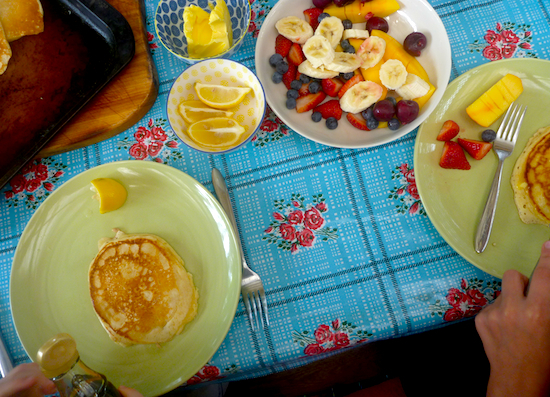 It’s been my ‘go-to’ recipe for American style pancakes ever since I first made it (when on holidays, of course) and I was drawn to it because of the simplicity of the ingredient list (when you’re on holidays, you don’t want to get bogged down with too many ingredients). The other great thing about this recipe is that it’s a basic ratio recipe, so you can scale it up and down depending on how many mouths you have to feed. Then, there’s an added bonus – once you know the ratios, you never have to look up the recipe again. The only slightly fancy thing I do with it is to separate the eggs and add the egg whites separately at the end. I got this tip from my friend Alice, who swore that this simple technique made the pancakes fluffier. I can vouch for this because I have actually done a controlled experiment for this. 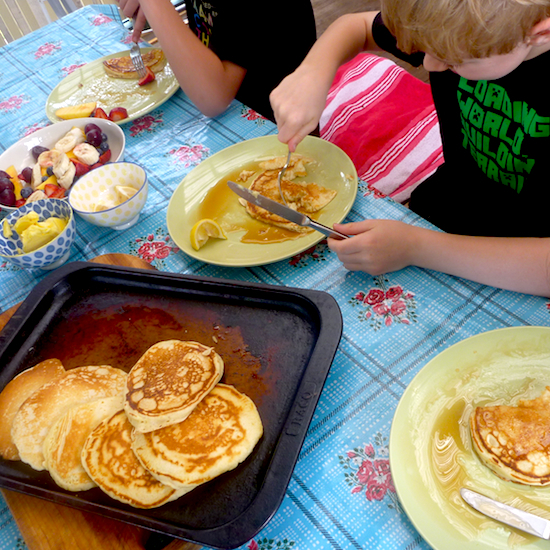 One of the first times I made these pancakes, I had three more children turn up for breakfast unexpectedly and I made a quick second batch with the separated egg technique and it was true – they were actually fluffier! It’s like some magical cooking alchemy because you don’t actually whip the egg whites, just add them at the end. There must be some science behind the extra fluffiness but I don’t know what that is. The only the other thing I might add is that the champion pancake eaters of my acquaintance are my 10-year-old nephew and one of my son’s best friends – they have both tied at seven pancakes at one sitting. 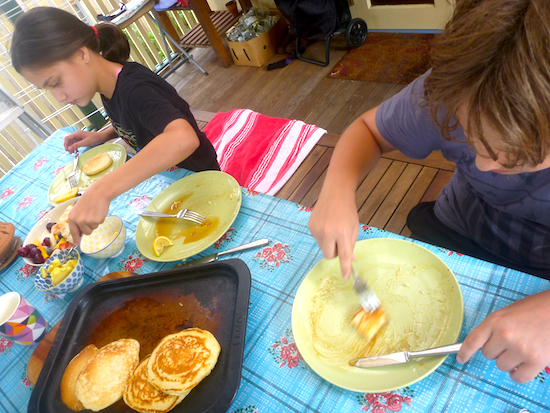 Seven pancakes is a quite scary amount of pancakes for one child to eat but it just goes to show these pancakes are pretty damn good. Stir self-raising flour and sugar together. Then stir in milk and egg yolks until just mixed (you don’t want to over mix). Then add egg whites and mix through. If you want to keep your pancakes warm while you cook them all, heat your oven to 100°C (200 F) and stack the pancakes on an oven tray as you cook them. *You can make your own buttermilk by adding 1 tablespoon of lemon to 1 cup of milk and let it sit for 5-10 minutes until curdled.